Ken Rockwell has lost his mind. What else can it be? He's gone over the edge. For those of you wondering what the hell I'm talking about, check out Ken Rockwell's Web site. He runs a web site with articles related to photography (plenty of Nikon stuff). I generally don't agree with his conclusions, but enjoy reading his stuff nonetheless. He has a definite sense of humor and a take-no-prisoners approach that I find refreshing. He does not hide the fact that what he writes are his opinions. Now, I don't usually write about fellow bloggers/webmasters, but this time, Rockwell has gone too far. Case in point, Rockwell's "review" of the forthcoming Nikon D200 digital SLR camera. I put review in quotes because Rockwell has not even seen the camera yet -- it's scheduled to be released in late December. Yet he has a couple of pages reviewing the camera on his site! It's bad enough that he's reviewing a camera he has yet to actually hold in his hands, but he draws conclusions about its performance and compares it to other cameras based on the spec sheet alone. The D200 is Nikon's latest DSLR. It's a semi-pro camera positioned between the hugely popular D70s and the full-time professional D2X. It has absolutely nothing to do with the 3-1/2 year old D100. That's true, until you get to the third sentence. The D200 actually replaces the Nikon D100. I expect that this will be the most popular camera used by professional photographers due to its light weight, low cost, high speed and tough magnesium body. In my opinion it obsoletes the D2X, since it does 90% of what the D2X does without the weight and expense. Well, as my three-year-old daughter would say: "No. No. And more no." The D200 will definitely not "obsolete" the Nikon D2x. It will definitely obsolete the D100, and maybe even the D70/D70s, but definitely no the D2x. The D200 and the D2x are two different cameras aimed at different audiences. The D2x is a professional camera, used by plenty of professional photographers (and many non-professionals as well). The D200 is aimed at "advanced amateurs." It does not do "90% of what the D2x does" as Rockwell says. It shares a number of features, like a tough magnesium body, matrix metering and a nearly equal fast frame rates. But that's about it. Rockwell likes the D200 because it's smaller than the D2x, lighter, less expensive and has a built-in flash. He's a nut for the built-in flash. I expect that this will be the most popular camera used by professional photographers due to its light weight, low cost, high speed and tough magnesium body. I agree. I think the D200 will prove to be one of Nikon's most popular cameras and many professionals will use it as a back-up to their D2x because it shares a number of the same features. So what's the big deal, you're probably saying to yourself, one guys writing his opinions about a camera, get over it. Ok. But consider this, in one forum alone, there is a thread (as of yesterday) with 71 posts about Rockwell's D200 review -- and they're almost all negative. Apparently I'm not the only one that thinks its a bit disingenuous to purport to do a review of something that no one has seen yet. On a related topic, the French photography magazine Chasseur d'Images did an entire review on the D200, using a pre-production sample of the camera. That's almost as bad as doing reviews the way Rockwell does them. The difference between a pre-production sample and the full production camera can be enormous. But usually the changes are for the better in the full production version. These are just two examples of how not to do a camera review. But hey, it fills Web and magazine space. First there was Jayson Blair and his bogus stories. Then there was Judith Miller and her stories about weapons of mass destruction (which we all know did not exist). And now there's a new scandal at the venerable Gray Lady, The New York Times -- an article about the yet-to-be-released Nikon D200 with a photograph of said camera prominently displayed for all to see. OK, so maybe it's not a scandal of the same proportion as Blair and Miller, but it's pathetic nonetheless. So, what's the big deal you ask? Well, the problem is that the photo of the Nikon D200 (the camera above is the one they used) accompanying the story is fake. It's a composite photo of a number of different cameras put together in Photoshop. And to make matters worse, the Times article, entitled "A Betwixt and Between Nikon: 10.2 Megapixels for $1,700," came out on November 10, a full nine days after the camera was announced. Nikon already had press photos of the actual camera available by then. Well, after some postings on various digital camera forums and probably tons of e-mails to the newspaper that started off "Yo. Morons. That picture of the Nikon D200 is a fake." The Times finally replaced the fake photo with one of the actual camera. They corrected the story on their web site, but the article ran in various editions of the paper with the fake photo. A picture that originally appeared with this article was published in error. The picture had circulated online in anticipation of the camera's release, but did not portray the final product. The correct image is above. Didn't portray the final product? Hell, it didn't portray any product because the photo they ran depicts a camera that doesn't exist. But hey, at least they admitted their error and corrected it quickly. The correction leaves more questions than its answers, however. Why did they run the photo in the first place? Granted, they probably didn't know it was a fake. But the fact that they swiped the photo off the Internet in the first place, instead of going to Nikon for the real thing is troubling. Since the photo was fake, they obviously swiped it off someone's web site, or worse from a Nikon forum posting. I say worse because if they did get it from a Nikon forum, just reading a post or two would have clued them into the fact that the photo was a fraud. I suspect they prepared the story in advance of Nikon's Nov. 1 D200 press release and were looking for a photo to illustrate the story. Since they couldn't get one out of Nikon (though I have no idea why. Nikon makes these things available to the press long in advance of their official announcements), they figured they'd troll the Internet for a photo. I guess we should give them an "A" for effort, but they still win the "Stupid is as Stupid Does Award." A little bit of research would have uncovered the fact that there were dozens of these fake D200 photos floating around out there. All they had to do was Google "Nikon D200" and they would have known what was going on. Nice going guys. So far you're three for three! Cruise through any news group related to digital photography and you'll find they all have one thing in common no matter which camera the group is dedicated to -- the largest threads will be about High ISO Noise and how it is a problem that needs to be eliminated at all costs. It always makes me laugh that when you get two people from different dSLR camps together -- Nikon and Canon for example -- the easiest way to start a flame war is to mention High ISO Noise and that one camera handles it better than another. According to Canon enthusiasts, Canon cameras handle image noise better than Nikon does, particularly at ISO values above 800. Well, it depends on what your definition of "better" is. Canon images shot at high values (800, 1600, 3200) seem to exhibit less noise than Nikon's because Canon uses a lot of in-camera noise reduction (both user-selectable and built-in). As a result, Canon images shot at high ISOs look "soft" because of all the image processing the camera does. Nikon, on the other hand, does less image processing in-camera, preferring to let the photographer handle it in post-processing. As a result, Nikon camera produce images that exhibit more noise at the same ISO values. Where this obsession for noise-free digital images comes from I'll never know. I suspect it's because the proponents of noise-free images have never shot film. They don't know what film grain looks like or what purpose it serves. Also, how often do you need to use high ISO values anyway? In more than 30 years of photography, I've generally never needed film faster than 400 ISO. Granted, when shooting weddings, ISO 800 speed film comes in handy in many situations. But the only time I've used anything faster was when I was experimenting with a new film. I often wonder how much the people who complain about High ISO Noise actually shoot at high ISO values. Have they ever shot ISO 3200 film? If they did, then they'd know what grain looks like! For some strange reason, inscrutable in a true Oriental fashion, photographers (or more likely, gearheads masquerading as photographers) have become obsessed with "noise" at astronomically high ISO speeds, even if these are outside the approved camera settings. Each to his own, but I frankly cannot see the relevance for some of these heated debates. People should try faster lenses or make other improvements to their technique before complaining about noise at 3200 ISO equivalency. Or try 3200 ISO film, that'll teach them a lesson in what's relevant. Digital images need a bit of noise in them. It helps prevent that "plastic" look you see with a lot of images. Too much sharpening, noise reduction and other post-processing tricks tend to make digital images look too perfect and not very realistic. Besides, coming from a film photogrpahy background, I'm used to seeing some film grain (the analog equivalent of image noise) in my images. It gives them depth and character. I think the "gearheads," as Rorslett correctly calls them, should worry less about High ISO Noise in their images and more about learning how to use their cameras to produce better pictures. 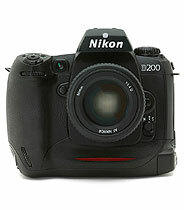 On Nov. 1, Nikon Corp. announced its long-awaited and eagerly anticipated new digital SLR, the D200. There had been rumors for months that Nikon was going to release a successor to its aging D100 camera. There were leaked photos floating around and leaked specs. There also were a ton of rumors flying around on the newsgroups: it would have a CCD sensor, no it would have a CMOS sensor; it would be 10.2 megapixels, it would be 10.4 megapixels, it would be 12.4 megapixels; it would have a built-in flash, it wouldn't have a built-in flash. A veritable feeding frenzy grew up around the camera, which hadn't even been announced yet. Looking at the specs for the new D200 (both the rumored ones and the official ones in Nikon's press release), got me to thinking. Some of the specs for digital cameras sound very impressive, but are virtually meaningless to the average human. Computer and digital camera geeks may get a thrill from the numbers, but normal people have no clue what the hell the camera manufacturers are talking about. And the camera manufacturers are well aware of this. They exploit it to their advantage to build a buzz around their newest products. For example, the new Nikon D200 boasts a 10.2 megapixel CCD sensor featuring a large image size of 3,872 x 2,592 pixels (it also has settings for medium and small image size). Sounds impressive enough. So I decided to check the specs against Nikon's top-of-the-line professional digital SLR, the D2X. It sports a 12.84 megapixel CMOS sensor, featuring a large image size of 4,288 x 2,848 pixels. Sounds even more impressive, doesn't it? But then I realized. I have no idea what the hell those numbers mean. And I will bet you that 99.9% of the human population doesn't either. The numbers themselves are meaningless (and not just because I'm math-challenged). With digital camera sensors, the size of the sensor itself is less important than how the photosites (they gather light and generate pixels) are arranged and what their size and shape are. Spouting megapixels for this and that is just marketing hype that sounds impressive and technical. But what it does is make it hard for the average person to compare the specs of different cameras. A huge myth as sprung up about megapixels, and that more of them are better. A 6 megapixel camera is not as good a an 8 megapixel camera. How can it be, it has less megapixels? Well, that's not necessarily the case. But that's a subject for another column. What would be more useful to the camera buyer is what size file the camera outputs. Saying a digital camera has a 4,288 x 2,848 pixel sensor is just as useful as saying a quarter is just shy of an inch in diameter, or a nickel is three-quarters of an inch in diameter. That may be useful if you plan to shingle your house with quarters. But if you plan to use it for its intended purpose, it's not useful at all. It's more useful to know that a quarter is worth 25 cents and a nickel is worth five cents. Nikon's D2X, with its 4,288 x 2,848 pixel sensor, outputs a TIFF file that's 36.5 megabytes. The sensor on the D200 outputs a large file that's about 20.7 megabytes. This, of course, changes if you shoot RAW or JPG files and what size you choose to shoot. This would be more practical information. It tells the average person much more than the pixel size of the sensor. The average photographer deals with megabytes all day long -- it a well-known commodity. Pixels, not so much. When you manipulate a file in Photoshop, you save it to a certain size, usually in megabytes. If you're sending an image to a friend through e-mail, it's useful to know what's the largest megabyte file his e-mail client can handle. He doesn't tell you to send him a file no larger than 3,500 pixels, does he? If he does, he's definitely a geek! The point is, real-world information -- while maybe not as impressive sounding as pixels, CCD and CMOS -- are more useful to the average human. Camera manufactures should translate all the digi-babel into a language us humans can easily understand. After all, we're the one's who buy their products and use them.